Well done. Main lake or in a creek? What was the water temp in that area? Thanks! You all did better than us. We launched about 730, off the water by 1230. 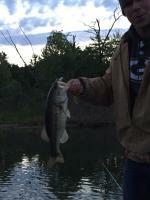 Fished main points and swings with different dragging baits, a rig and jerk baits. Caught a couple on main swings around some timber in 16-18ft as it fell off into the main river channel but we struggled to find much. Id guess 1ft or so water clarity down river from CC launch and warmest we saw was 43.5 or so. Thanks for the report champ, that sums up at least part of why we struggled. Couldnt get many bites on moving baits but literally said to ourselves, "today is not the day to drag something, just wouldn't make sense." Champ, As someone who doesn't tournament fish, I don't worry as much about giving away my 'spots.' Surely anyone who comes to this site for info knows fishing wind blown main lake points is a good starting point. I get the vultures that don't contribute could be frustrating to you guys who tourney fish, but if those vultures are following my lead they're of no threat to win! ☺ The thing i hoped for after posting a detailed outing is getting detailed responses from someone else who had more luck. We struggled yesterday and we frankly don't know what else to do for more success. Thanks so much cheesemaster for the info, I'm also not one to fish deep with any success. I'm sure I'll have plenty to report of things NOT to do to catch em ☺. Happy thanksgiving!